#1 PARTY TOUR IN POLAND! Our Guides will introduce you to awesome party games to make your night even better! In each of the bars & clubs we are going, you will receive a free shot! Na zdrowie! We will show you the real local nightlife experience! This night will get even more crazy with the challenges our guides will give you to do - go out of your comfort zone! Me and my sister had a blast on mondays pub crawl. We weren’t sure what to expect and all thought we were a small group we got along perfectly and made some great connections. Wlada was our guide and she was amazing, really showed a lot of care, and had a great sense of humor. We had so much fun, the group even met for lunch the next day. 10/10 defenitly would like to repeat the experience again! We love you Wlada ❤️ Regards from Slovenia! 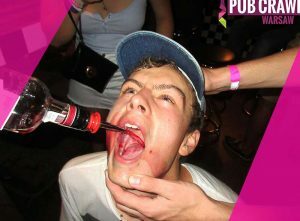 I did the pub crawl during the week and had an amazing time. 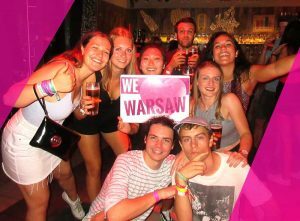 It’s a great way to meet new people from around the world and to explore bars/clubs in Warsaw. Klaudia was our guide and she was phenomenal. Klaudia knew the bar scene really well, she selected great bars and made sure everyone was having a good time. 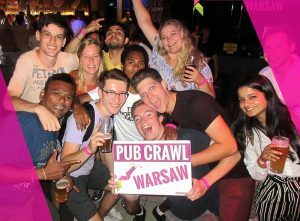 I’m glad I did the pub crawl and would highly recommend it to anyone who wants to experience Warsaw’s nightlife. 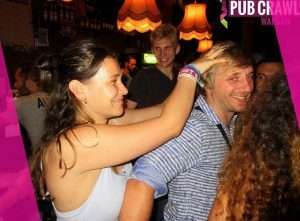 We had a really great weekend in Warsaw thanks to the people of the Pub Crawl. Couldn't have wished for a better guide to show us the Warsaw night life! We had such a good time doing the pub crawl we decided we do the pub crawl twice in a row. We did some drinking games and had the best guides, named Kasia and Julia. When you visit Warsaw, this pubcrawl is a must do! I love how the pub crawl takes you to specific bars to get a taste of poland, and then to a really cheap one before you go dance your *** off! Monika is a fantastic pub crawl leader. SHe really knows how to get people excited and talking and makes sure everyone has a great time! We were a bit apprehensive at first, not willing to pay up front for a night we were not sure would be good but it was throughly worth it and very good value for money. We were given 5 free shots, which were all different flavours and that I had never tried before. We spent slightly too long at the first bar in the city very close to the palm tree, but afterwards we went to 2 other beach bars which were very chilled and great places to chat and get to know everyone else on the crawl, we went on a tuesday in July and there were 8 people in total which was a great number of people for getting to know each other. Then went to a beach bar/club on the river, it had great atmosphere and the dancing and chatting was so fun we stayed until past 4am, to attempt to see the sunrise. It was one of the best nights of I spent whilst I was travelling around Europe. 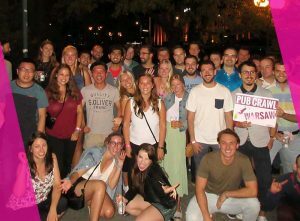 Warsaw Pub Crawl is the one & only Pub Crawl in Warsaw that started organizing party tours back in 2011. Our Local Guides are carefully selected to deliver you the best nightlife experience that you deserve while visitng the capital of Poland! Awesome people places and drinking games . The most proper way to have fun abroad. I used to participate in pub crawls despite of fact, that i'm local. The energy and fresh blood that you can meet there is addictive, it's always great to hear strangers from foreign countries with lots of amazing stories and all that in a friendly atmosphere. Great stuff! Chilled out and fun night where you can meet all kinds of people. Had an awesome time with these people. Guides were fun, cool and there was enough booze and games to get the party going and to loosen up the atmosphere. Liked it so much I did a few pub crawls as a guide afterwards! Made friends from around the globe. Perfect if you want to get to know the nightlife in Warsaw too. Had the most perfect time of my life. Awesome guides took us to amazing places. Also made some new friends.